DISCLAIMER: This is a work of fanfiction for my personal entertainment (and maybe yours). Dragon Age: Origins and Dragon Age II and all related characters and locations are the property of Bioware Inc. RATING: Grown ups. Mardelle looked up at Fenris, seeming to seeing him and the others for the first time. “Who are you.” It was not a question and Zevran wisely stepped in, putting a hand on Fenris’ arm. “I do not think my wife will appreciate your anti-mage views right at this moment. Why don’t you go out and look for high dragons to play with instead. It would be safer.” Fenris shrugged off Zevran's hand, but a look from Joili prevented him from pursuing his cause. Grudgingly, he stormed out of the cave. Anders managed to hide his smirk over Fenris’ departure, turning his attention instead to Marethari. He knelt beside Mardelle, passing his hands over the Keeper’s body, knowing it would do no good. He gently closed her unseeing eyes. “I’m sorry, Mardelle.” She gave him a faint smile of thanks and sighed heavily. “Merrill,” Joili sighed, shaking her head, “I was a fool to allow you to get this far and risk all of our lives. I will take responsibility for that much, but you need to open your eyes. Your people had good reason to fear your actions when you refused the wisdom of your Keeper and your friends.” Joili wanted to say more, hoping that Mardelle would allow it, but knowing that she should not come between them. But it seemed that Mardelle understood. She rose, nodding to Zevran, who gently lifted Marethari in his arms. Mardelle used her good hand to pick up the dagger Merrill had used to kill the Keeper, still thick with darkening blood. She tossed it at Merrill’s knees and followed Zevran and Anders. “The clan will want your blood,” she said as she passed by Joili. Mardelle turned and walked away, leaving Merrill utterly alone, even with Joili standing there. Through her tears, she stared at the blade before her. "Was I .... wrong, Hawke?" Merrill said after a time. Merrill looked up sharply, "Well that was surprisingly to the point." 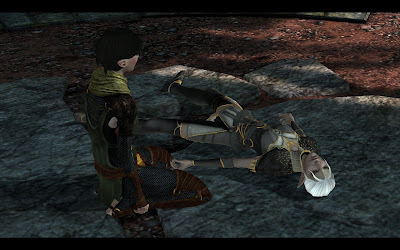 "I'm sorry, Merrill," Joili sighed, kneeling beside her, "I never believed that you would go this far. I thought you had learned your lesson after the Fade, but I was so very wrong. And now Marethari's death is as much on my hands as it is yours." "But I did learn from the Fade, Hawke! I would have resisted this time! I -- I could have resisted... I'm sure of it...I'm ... sure...."
Joili wrapped an arm around the tiny elf and held her tightly as the sobs shook her. "What do I do now, Hawke? I have no place to go." "I know," Joili whispered, picking up the dagger. "I'm sorry." I just noticed that you changed your Mass Effect journal into this. Or did you delete the Mass Effect journal and start this one? Changed it into a full gaming journal and a place to keep my headcanons.